Ajwain, pronounced as uj-wine, is a "seed" often used in Indian cooking. 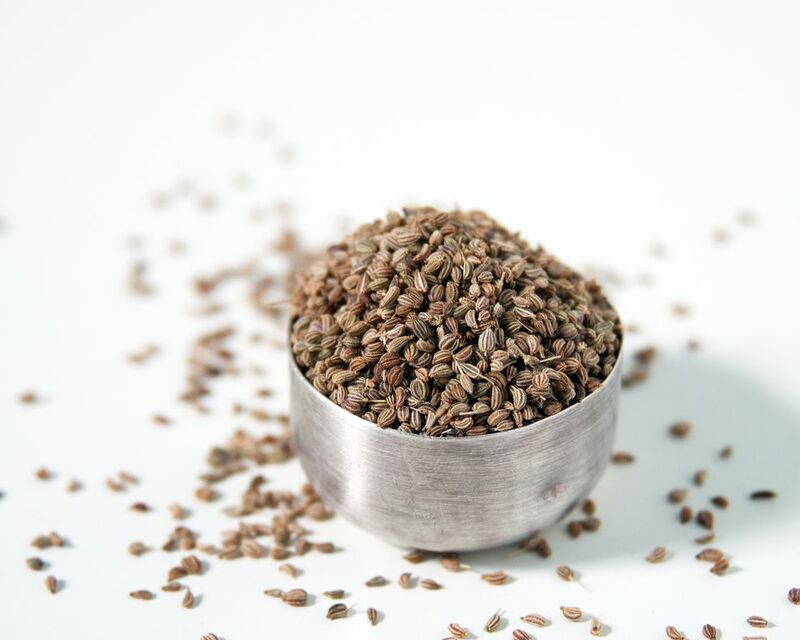 Ajwain is an annual herb and the plant's leaves and fruit—often referred to as seeds—are pale khaki colored, oval shaped, and look like a smaller version of cumin seeds. They are highly fragrant, smelling a bit like thyme (because they contain thymol); their bitter taste, however, is similar to oregano and anise. Ajwain is also known as carom seeds or bishops weed. Ajwain is mostly sold in seed form since it is rarely if ever used as a powder in Indian cooking. If you ever require the powdered form, it is advisable to buy the seeds and grind them at home as required. In Indian cooking, Ajwain is often part of the tadka in a dish. Tadka, or tempering, is a cooking method in which oil or butter (most often ghee) is heated until very hot and whole spices are added and fried, creating what is called a chaunk. It is used in small quantities and almost always used cooked. This is because of its strong, dominant flavor. This oil and spice mixture is then incorporated into lentil dishes, or added as a final touch or garnish to a dish. Ajwain is also used in vegetable dishes (for its distinctive taste) and pickles (for its preservative qualities). In Afghanistan, the seeds are used when baking breads and biscuits and are sprinkled over the top. As a cure for diarrhea, dysentery, and indigestion: Boil a cup of water with 1 tablespoon of Ajwain until the water is reduced to half its original volume. Drink this water. To relieve symptoms of a cold, like a stuffed nose: Add 1 tablespoon of Ajwain to a bowl of boiling water and inhale the steam. To ease rheumatic pain: Ajwain oil must be applied on the affected part of the body.